January 12, 2011 January 12, 2011 Dan O. Reason why classics, should just be kept as that. This remake of the 1960 shocker stars Anne Heche as Marion Crane, who makes a fateful stop at the Bates Motel — run by mama’s boy Norman Bates (Vince Vaughn) — after embezzling $400,000. When Marion fails to show up for work, her disappearance triggers an investigation by her lover (Viggo Mortensen), her sister (Julianne Moore) and a private eye (William H. Macy) … who discover that Norman has a morbid secret. Everybody knows Alfred Hitchcock’s original 1960 classic. They all know the shower scene, the twist ending, and most of all, Norman Bates. So you think it would take a mad man to try and do something with that, and remake it. Well Gus Van Sant just is that mad man. Director Gus Van Sant I think is trying to experiment here, and see what it is he can actually do with a remake like this. But the problem is, there’s nothing much he can do. This is a shot-for-shot remake, with a couple of changes here and there, and it’s filmed in color. The colors I liked, but the problem is that he doesn’t do much different here, than what was already done in the original. The score is practically the same, as well as the script, so what the hell is the point of this remake? I think the answer to that was an experiment. Van Sant wants to see if you can actually remake a classic, and put it in the modern world, but still keep it the same, and it having the same effect. I’ll give Van Sant points for at least grabbing his balls, going out there, and messing with a classic like he did. However, the problem is that this just isn’t anything new. It’s the same film, same twists, same dialogue, basically same everything. And I wish I could say it was enjoyable, but it really wasn’t cause I could easily just pop in the original, and have a better time. Why? Cause it’s the original, and nothing beats that. Sorry Gus. The acting is alright to say the least. Anne Heche is OK in this film, but doesn’t do much to her character, that hasn’t been done before. Viggo Mortensen is actually a lot more creepier than I expected, so although he tried, I couldn’t really take him as this regular, ordinary dude. Julianne Moore is very good in a couple of scenes that she has, as well as William H. Macy, who demands the screen every time he is on. Vince Vaughn is actually surprisingly good here as Norman Bates, the only problem is that he is playing Norman Bates. I think that the only reason he doesn’t do as great as he could have was because Anthony Perkins perfected it so well. In another film, Vaughn could easily pull this role off, but the problem is that he’s trying to do the same thing that Perkins did, and he gets a bad rep. But Vince is equally as creepy, and does the best job out of the whole cast. Consensus: Van Sant tries to remake this 1960 classic, but fails, because nothing is new here, it’s all the same with a few changes, so it all just seems pointless. Further proof as to why certain people should leave classics, be classics. I completely agree that Van Sant handicaps his own experiment by going shot-for-shot. The cast just does not bring enough to the table to leave their mark in these confines. Which ultimately raises the question by the end: “If you are not going to bring anything new to the table, why remake it in the first place?” I think Van Sant’s other experimental films (e.g. Gerry, Elephant, etc.) were far more successful. He really didn’t do much to this material, and the acting wasn’t amazing, so it was rather pointless really. 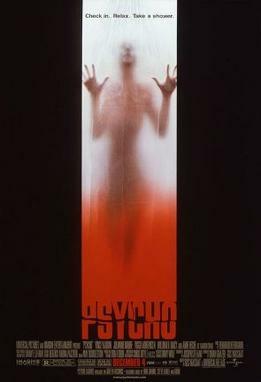 I thought that Van Sant’s attempt to remake Psycho was interesting. He updated some elements and some of his cast members chose to flesh out their characters, while others went in the original direction. If a movie is a classic and you do a shot-for-shot remake, with you and your actors knowing, or guessing, what’s good about the original, who’s to say that your version might not be even better than that original. For example, when folks mention The Thing these days, they always seem to be talking about the remake, whereas I regard the original as (for me, cause I saw it as a kid and it scared the poop out of me) the classic. So Van Sant took a shot at it and, low and behold, whatever made the first one a classic got lost in the remake. 😦 It’s like Van Sant tried to recreate the soul within the movie but nothing happened. Let’s hope that cloning doesn’t work like that. I guess you right. It’s almost like a cover of a famous song. It’s not perfect, but it’s not supposed to be I guess. But still, I found this to be pretty pointless. Couldn’t they at least stick to remaking films that were kind of crappy to start with? I’ve never understood the point of making a shot for shot remake of a movie that you couldn’t possibly make any better. Exactly, it’s so pointless really. Hahah I get what you mean. This was just stupid, and basically pointless. Thank you for this review. My brother’s been egging me to watch this remake with him because he liked the original, but now I can tell him that it’s definitely not worth it. It is def not worth it in all honesty!